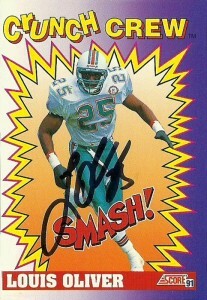 Louis Oliver was a hard hitting safety out of Florida. With their secondary aging rapidly and their defense becoming a liability, the Miami Dolphins drafted Oliver in the first round of the deep 1989 draft. After taking Sammie Smith at pick #9, the ‘Fins watched Steve Atwater and Donnell Woolford come off the board before grabbing Oliver with the 25th pick. Oliver was an imposing specimen at safety, weighing in at roughly 225 and had the height (6’2″) to cover receivers as well. Louis was very fortunate. Not only was he playing in his home state, but he was also paired up with his former team mate at Jarvis Williams who moved over to SS, while Louis fit right in at FS. The two made an imposing tandem and helped give some stability to the secondary. Oliver in the meantime was becoming well known as a ball hawking defender for the Dolphins. Starting 13 games his rookie season, he notched 4 picks, 1 forced fumble, and 62 tackles. In 1990 Oliver made his first career sack against the Indianapolis Colts. He recorded 5 interceptions that season, and repeated that in 1991 and 1992. 1992 was perhaps his finest season, with a career high 90 tackles and 5 interceptions, one of which he returned 103 yards against the Buffalo Bills. After an injury shortened 1993, in which he played in 11 games, Louis signed and played with the Bengals for one season at SS in 1994. He returned to the Dolphins in 1995 playing in 5 contests at FS that season. 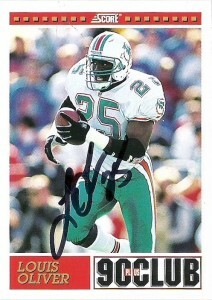 He completed his final season in Miami at SS in 1996 where he recovered a career high 5 fumbles that year. Louis remains firmly entrenched in Florida and has made many business and sports inroads since retirement. At last glance he is working in the real estate market.